Please Note: The All American Pressure Canner 910 10 Quart is not recommended for canning fish. All American Pressure Cannersare not recommended for use on glass top/ flat ranges without first checking with your stove manufacturer because their weight may cause the glass/ceramic to break. The diameter of the canners are larger than most burners and may cause heat to transfer outward and damage the surrounding surface. All American Pressure Canners are intended and manufactured solely for home use applications. they are not intended for commercial applications. 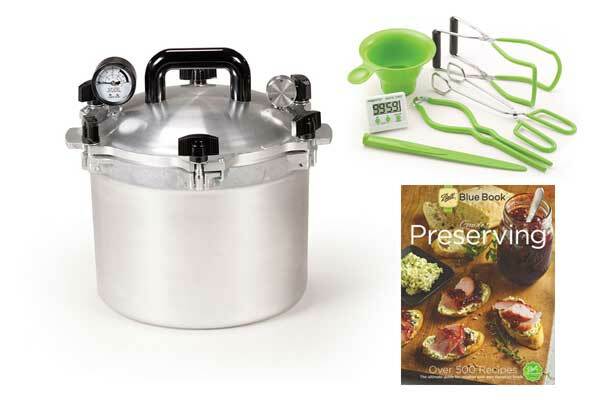 This Kit includes: the All American 10 Quart Pressure Canner, the Presto 7 Function Canning Kit, and the Ball Blue Book. **All American 10 Quart Pressure Canner- This 10 Quart All American Pressure Canner is the perfect size to use when canning small batches it can also be used as a pressure cooker for days that you want to fix a quick meal.